The difference in center of gravity and center of pressure is of great discussion as of late in the golf swing. This is a simple look at center of gravity and center of pressure and the differences and how to train the CG and COP to be in the correct places during the golf swing. Having the correct CG and COP would correlate to some pretty good club numbers when talking about path and clubhead speed and low point control. Creating a swing that is on plane during the impact zone and one with power sometimes can be as simple as discussing a player’s center of gravity and how to control it during the swing. Center of gravity and pressure distibution are very powerful components of the golf swing, if understood and applied correctly. A lot of times when a player swing’s over the plane in the downswing their CG will be out in front of the ball at impact and the path of the club will be swinging, for a right handed player, left of the target line. We all know the over the plane downswing that can create a fade, slice, or a pull shot. When the CG stays over the ball or even slightly in front of the ball at impact the player typically has not over rotated their upper torso on the downswing and the path of the club can swing more on plane or right of the target line. The body has three angulations and the center of gravity can move in all three planes of motion in a three dimensional manner. The center of gravity is controlled by the position of the body and the direction the segments (your arms and legs) and torso are moving. 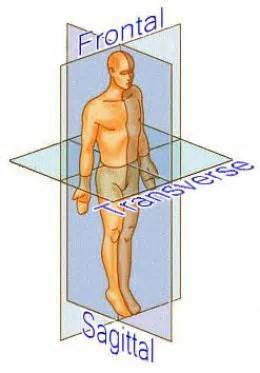 The three planes of motion are the Sagittal, Frontal, and Transverse. Take a look at the following two charts to help understand the three planes of motion better and also from a measuring stand point the X, Y, Z plotting chart we all used in high school. * Sagittal is front to back, Frontal is side-to-side, and the transverse plane is the rotational plane. This can also be shown in the x, y, and z coordinates in a plotting chart. 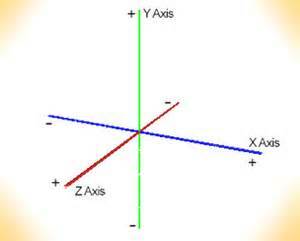 * X is the Frontal Plane towards the target, the Z is the Sagittal Plane, and the Y is the up and down loading or extension a player has. Now that you have a better understanding of where the center of gravity can move, let’s talk about where it is in your body. Depending on your body type, and where the weight is distributed over the length of your body, it can vary slightly, but generally most people’s CG is between your belly button and your heart. When a person bends at the waist, say towards a golf ball in their setup, the CG moves slightly towards the arches of your feet. If you were standing in an upright position the CG would be more towards heels. Think of a basketball player trying to jump as high as he can to grab a rebound. He would squat down, loading his weight, better known as force, into the ground and then explode up pushing off the ground to grab the ball off the rim. This simple load and explode analogy is also to an extent how a golfer loads and explodes during a powerful downswing and post impact position. In the golf swing, the CG moves in a simple looking pattern if used correctly. If the player has too much initial lower or upper body rotation in the downswing then the CG will not stabilize, thus giving the CG chart a very erratic pattern. If you notice in the CG image there is a slight hesitation in the movement of the CG during the transition of the downswing. This little hesitation or bounce is actually when the CG is moving towards the ground in the early downswing. This is the Dynamic Loading of the downswing, it is also when the club is being pulled on plane in the downswing with the arms and torso. 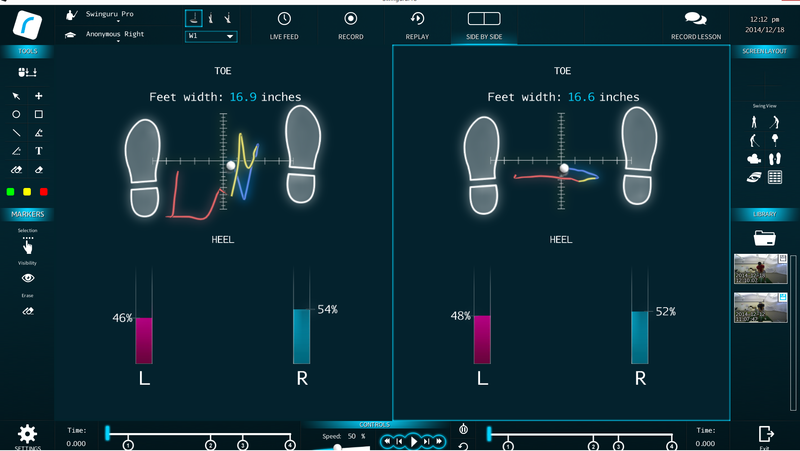 The software SwingGuru is extremely helpful with tracking the CG of the body during the golf swing. See the following image to get an idea of how the CG can move in the golf swing. Remember this is showing you from a view that would be from above the player looking down on the top of the golf swing. Notice the pattern on the right has much less erratic movement than the one on the left. This is the sign of a players that is controlling his CG verses a player that most likely has too much lower body rotation in the early downswing. 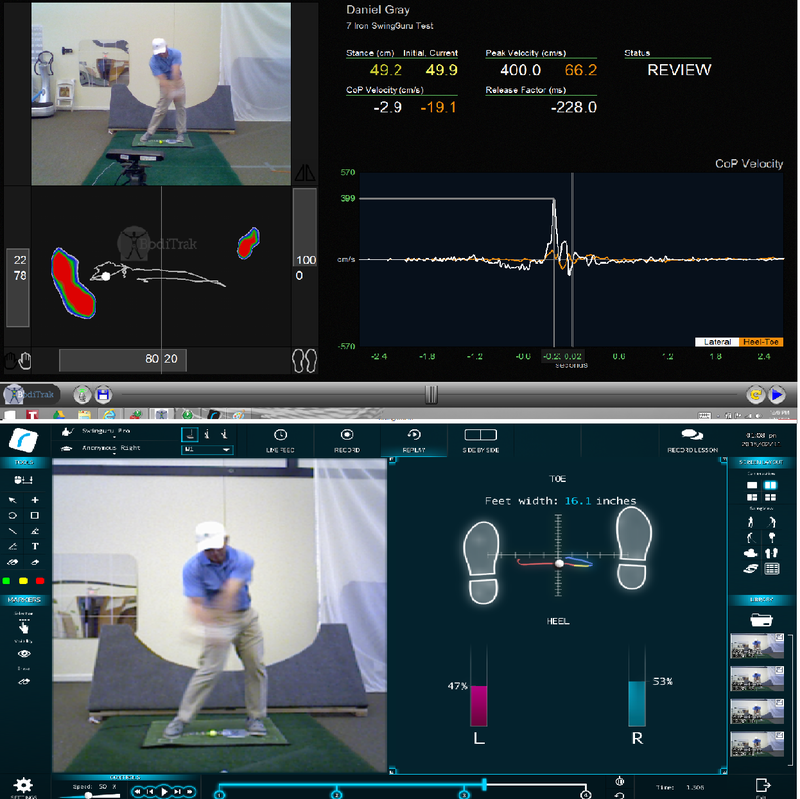 * SwingGuru is a software I use to track and measure center of gravity throughout the golf swing and as you can see in the following image there can be some significant changes when you maximize you kinematic sequence (order that the body in club move during the downswing) that can maximize your clubhead speeds. This software is great for showing you the Sagittal (Z on the plot chart) and Fontal plane (X on the plot chart) motion of the CG. The image above is shown at the setup position, but would change throughout the swing. At the top of the swing for a better player they would shift their center of gravity slightly in front of the ball at impact, but not further right than their COP and not as early (will discuss later in article). This is the aspect that is controlling the low point of the golf club and the sequence in the downswing. You can see the image on the right is much more clean than the image on the left, this would show a player that is using their lower body incorrectly and is difficult to control their CG. The player on the let has too much better lower body technique during the initiation of his downswing and a much smoother trace is possible. Learning how to apply pressure to the ground during you downswing is the topic of the following video and how your CG plays apart in maximizing your strength. This is a simplistic demonstration and there are many additional exercises that could help maximize your loading of GRF to be able to then learn how to use that ground for force. Learning to take this force that you have loaded into the ground and apply this to the a lateral movement through impact would be the next step to maximizing your clubhead speed and distance, but this is what most players do not do efficiently, so start here. Here are some measurements on what the CG and the COP would be during the exercises above. 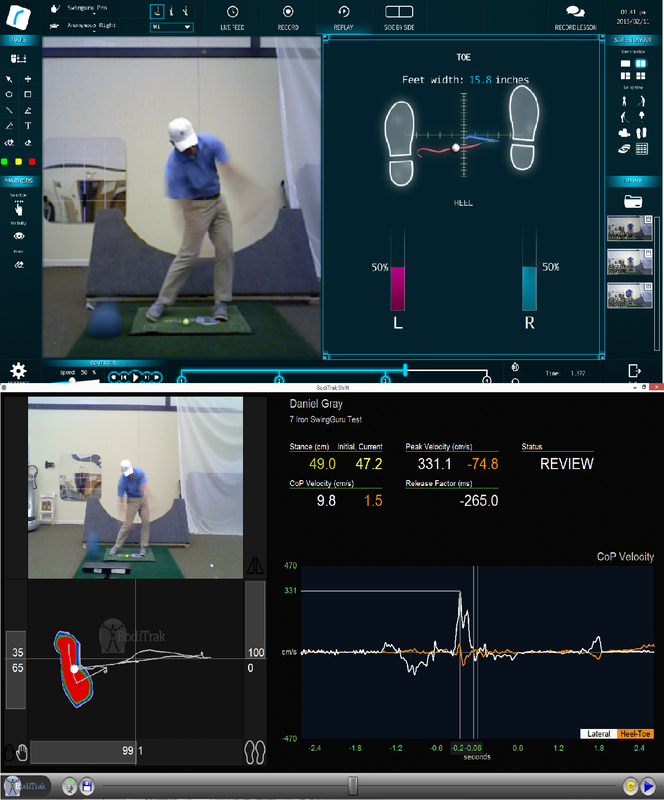 Notice that the exercise actually helps to add pressure to the right foot while maintaining the CG through impact.